A new ruling by Attorney General Bill Barr could keep tens of thousands of migrants seeking asylum waiting in detention indefinitely. Under US law, the Attorney General has the right to overturn rulings by immigration judges and Bill Barr did just that. Barr weighed in on an immigration case on Tuesday and said that asylum seekers who are awaiting removal and are not given a right to see a judge, should not be released into the US on bond. Asylum seekers who used to be released into the US on bond while awaiting a decision from a judge on their immigration case will now be kept in detention centers indefinitely where they could be waiting for years for. The decision is expected to affect a broad swath of immigrants coming to the southwest border to claim asylum. Immigrants who enter the U.S. without documents, or with documents suspected to be fraudulent, are placed into expedited removal before they have an interview with U.S. asylum officers at which they try to establish they have credible fear for their safety if they return to their home countries. The crisis at the US-Mexico border is the worst this country has ever seen. Multiple caravans originating in the Honduras with tens of thousands of military-aged male migrants have marched through Mexico northbound to the US border seeking asylum. In March alone, over 100,000 illegals were detained by US Border Patrol agents. In February, the President declared a national emergency to secure funding to build a border wall, however, the dangerous “catch and release” asylum policies are allowing illegals to be released into US communities. 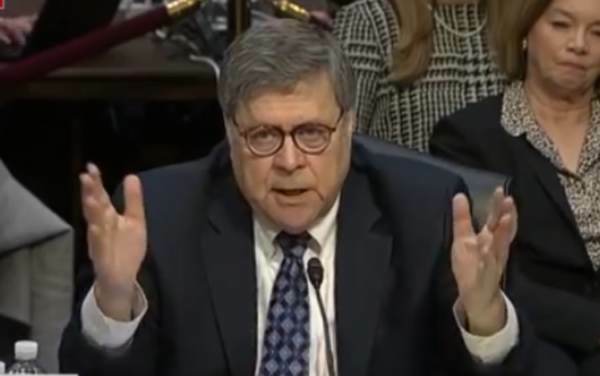 Bill Barr said during his confirmation hearings that he would be tough on illegal immigration and it looks like he’s stepping up to the plate. The post Ruling by AG Barr May Keep Tens of Thousands of Migrants Waiting in Detention Indefinitely appeared first on The Gateway Pundit.